- To create and maintain green spaces for wildlife, plants and people. 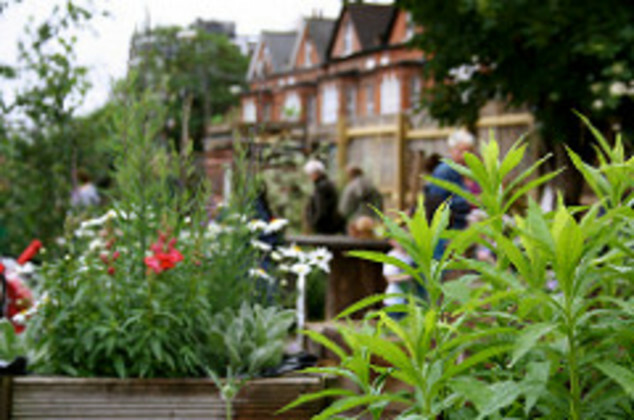 In May 2013 five local residents got together with the aim of creating a Community Garden in the heart of Forest Gate. On 6th July the idea for the garden was brought to the public at the Forest Gate Festival and received overwhelming support. Informal discussions began with the Council, owners of the site, in November 2013. The proposed site at the corner of Earlham Grove and Sprowston Road, originally a Victorian villa, was overgrown and had been used for fly-tipping for a number of years, although remnants of the house could been seen in places. The Garden was officially opened to the public on 12 June 2016 - a soggy but memorable day and it only took 3 years to get there!